A mill is a device that breaks solid materials into smaller pieces by grinding, crushing, or cutting. Such comminution is an important unit operation in many processes. There are many different types of mills and many types of materials processed in them. Historically mills were powered by hand (e.g., via a hand crank), working animal (e.g., horse mill), wind (windmill) or water (watermill). Today they are usually powered by electricity. Milling also refers to the process of breaking down, separating, sizing, or classifying aggregate material. For instance rock crushing or grinding to produce uniform aggregate size for construction purposes, or separation of rock, soil or aggregate material for the purposes of structural fill or land reclamation activities. Aggregate milling processes are also used to remove or separate contamination or moisture from aggregate or soil and to produce "dry fills" prior to transport or structural filling. In spite of a great number of studies in the field of fracture schemes there is no formula known which connects the technical grinding work with grinding results. To calculate the needed grinding work against the grain size changing three semi-empirical models are used. These can be related to the Hukki relationship between particle size and the energy required to break the particles. In stirred mills, the Hukki relationship does not apply and instead, experimentation has to be performed to determine any relationship. with W as grinding work in kJ/kg, c as grinding coefficient, dA as grain size of the source material and dE as grain size of the ground material. with the limits of Bond's range: upper dBU = 50 mm and lower dBL = 0.05 mm. Instead of the value of d80 also d50 or other grain diameter can be used. The specific surface area referring to volume Sv and the specific surface area referring to mass Sm can be found out through experiments. The discharge die gap a of the grinding machine is used for the ground solid matter in this formula. In materials processing a grinder is a machine for producing fine particle size reduction through attrition and compressive forces at the grain size level. See also crusher for mechanisms producing larger particles. In general, grinding processes require a relatively large amount of energy; for this reason, an experimental method to measure the energy used locally during milling with different machines was recently proposed. A typical type of fine grinder is the ball mill. A slightly inclined or horizontal rotating cylinder is partially filled with balls, usually stone or metal, which grind material to the necessary fineness by friction and impact with the tumbling balls. Ball mills normally operate with an approximate ball charge of 30%. Ball mills are characterized by their smaller (comparatively) diameter and longer length, and often have a length 1.5 to 2.5 times the diameter. The feed is at one end of the cylinder and the discharge is at the other. Ball mills are commonly used in the manufacture of Portland cement and finer grinding stages of mineral processing, one example being the Sepro tyre drive Grinding Mill. Industrial ball mills can be as large as 8.5 m (28 ft) in diameter with a 22 MW motor, drawing approximately 0.0011% of the total world's power (see List of countries by electricity consumption). However, small versions of ball mills can be found in laboratories where they are used for grinding sample material for quality assurance. F80 is the mill circuit feed size in micrometers. Autogenous or autogenic mills are so-called due to the self-grinding of the ore: a rotating drum throws larger rocks of ore in a cascading motion which causes impact breakage of larger rocks and compressive grinding of finer particles. It is similar in operation to a SAG mill as described below but does not use steel balls in the mill. Also known as ROM or "Run Of Mine" grinding. SAG is an acronym for Semi-Autogenous Grinding. SAG mills are autogenous mills but use grinding balls like a ball mill. A SAG mill is usually a primary or first stage grinder. SAG mills use a ball charge of 8 to 21%. The largest SAG mill is 42' (12.8m) in diameter, powered by a 28 MW (38,000 HP) motor. 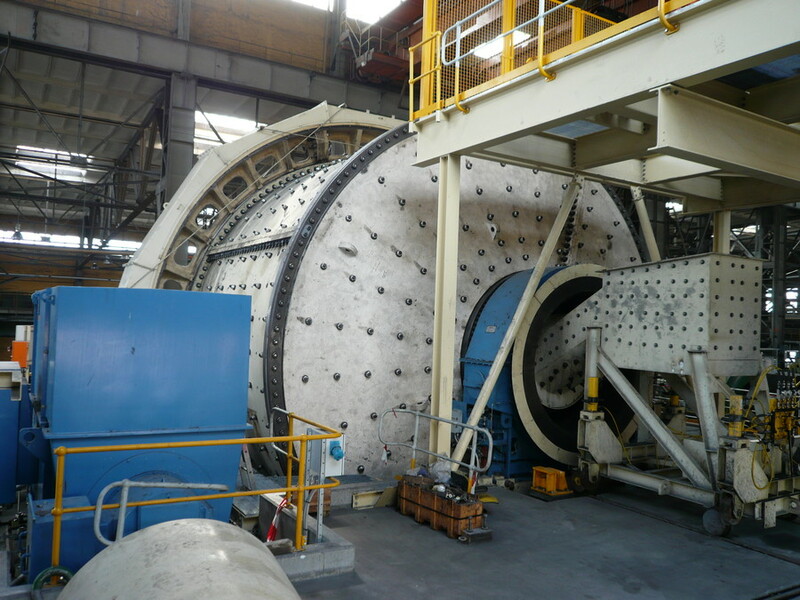 A SAG mill with a 44' (13.4m) diameter and a power of 35 MW (47,000 HP) has been designed. Attrition between grinding balls and ore particles causes grinding of finer particles. SAG mills are characterized by their large diameter and short length as compared to ball mills. The inside of the mill is lined with lifting plates to lift the material inside the mill, where it then falls off the plates onto the rest of the ore charge. SAG mills are primarily used at gold, copper and platinum mines with applications also in the lead, zinc, silver, alumina and nickel industries. A rotating drum causes friction and attrition between rock pebbles and ore particles. May be used where product contamination by iron from steel balls must be avoided. Quartz or silica is commonly used because it is inexpensive to obtain. A high pressure grinding roll, often referred to as HPGRs or roller press, consists out of two rollers with the same dimensions, which are rotating against each other with the same circumferential speed. The special feeding of bulk material through a hopper leads to a material bed between the two rollers. The bearing units of one roller can move linearly and are pressed against the material bed by springs or hydraulic cylinders. The pressures in the material bed are greater than 50 MPa (7,000 PSI). In general they achieve 100 to 300 MPa. By this the material bed is compacted to a solid volume portion of more than 80%. The roller press has a certain similarity to roller crushers and roller presses for the compacting of powders, but purpose, construction and operation mode are different. Extreme pressure causes the particles inside of the compacted material bed to fracture into finer particles and also causes microfracturing at the grain size level. Compared to ball mills HPGRs achieve a 30 to 50% lower specific energy consumption, although they are not as common as ball mills since they are a newer technology. A similar type of intermediate crusher is the edge runner, which consists of a circular pan with two or more heavy wheels known as mullers rotating within it; material to be crushed is shoved underneath the wheels using attached plow blades. Another type of fine grinder commonly used is the buhrstone mill, which is similar to old-fashioned flour mills. Tower mills, often called vertical mills, stirred mills or regrind mills, are a more efficient means of grinding material at smaller particle sizes, and can be used after ball mills in a grinding process. Like ball mills, grinding (steel) balls or pebbles are often added to stirred mills to help grind ore, however these mills contain a large screw mounted vertically to lift and grind material. In tower mills, there is no cascading action as in standard grinding mills. Stirred mills are also common for mixing quicklime (CaO) into a lime slurry. There are several advantages to the tower mill: low noise, efficient energy usage, and low operating costs. Arrastra, simple mill for grinding and pulverizing (typically) gold or silver ore.
^ Thomas, A; Filippov, L.O. (1999). "Fractures, fractals and breakage energy of mineral particles". International Journal of Mineral Processing. 57 (4): 285. doi:10.1016/S0301-7516(99)00029-0. ^ a b Mineral Beneficiation – The Third Theory of Comminution – Document Summary. Onemine.org. Retrieved on 2010-10-09. ^ Baron, M.; Chamayou, A.; Marchioro, L.; Raffi, J. (2005). "Radicalar probes to measure the action of energy on granular materials". Advanced Powder Technology. 16 (3): 199. doi:10.1163/1568552053750242. ^ "ABB". ABB Communications. ABB Communications. ^ Wills, B.A. (2006). Mineral Processing Technology: An Introduction to the Practical Aspects of Ore Treatment and Mineral Recovery. 7th ed. Amsterdam ; Boston, MA. p. 157. ISBN 0750644508. ^ Mular, Andrew L.; Halbe, Doug N.; Barratt, Derek J. (2002). Mineral Processing Plant Design, Practice, and Control: Proceedings. SME. pp. 2369–. ISBN 978-0-87335-223-9. Retrieved 26 October 2012. ^ van de Vijfeijken, Maarten (October 2010). "Mills and GMDs" (PDF). International Mining: 30.